While at the Starbucks nearby Cal Trans, I met some people who know about the 2nd street widening. When asked about the planned removal of the trees, one person wondered aloud "How did that rumor get started?" When told about the posting, he asked if it was from the city. It was. Then he mulled over it and said it may have been marked by accident when a series of trees were marked that day. Maybe that's how the tree on the L.A.P.D. site was removed. Marked by accident. 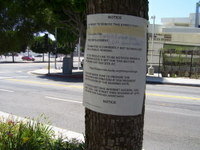 Pictured: Flyer announcing removal of trees, taken July 4th. Added note: Anyone want to be a City of Los Angeles Tree Surgeon? Here's your chance.